You are here: Home » Uncategorized » WEDNESDAY WEATHER : Scattered Thunderstorms Through Thursday Evening : Hotter! Do you like saving money? Yea, me too! Ken and Yvonne Harris at a.m. Fog on the Nelson-Albemarle County Line in Afton make it easy for you, while you get quality garden products. Right now Ken tells me they have all annual plants in stock marked off by 25%. WOW! 25% (PAUSE) Now that’s some real money! And the no spray cherries are ready! Yvonne says this was a bumper crop and they have plenty! And of course all the other Spinach, (we just planted ours from a.m. Fog) kale, brocoli, cabbage and veggie start, along with 6 kinds of lettuce and 26 types of heirloom tomatoes and sweet or HOT peppers are just some of what you’ll find at their new farm market right on Route 151. They even have pineapple and watermelons to boot! Then there’s asparagus. Yvette loves it grilled with just a touch of olive oil, pepper and salt! Mmm, mm. Then there’s , meat, and fresh baked bread along with a so many other vegetables I can even list them all. The beautiful new farm market is OPEN FOR BUSINESS NOW! 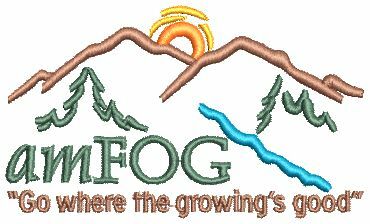 You can always visit them on the web at www.amfog.net or call ’em at 540-456-7100. Other area rainfall totals by clicking here. You’ve probably noticed some new widgets on our site lately. We can change them up depending on the weather, so check there anytime the weather is looking bad or if you just want a quick look at the radar! 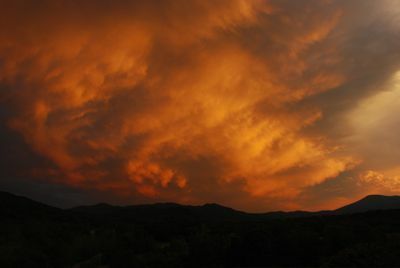 Look at that fantastic shot Ann Strober got in Nellysford of the storm clouds right at sunset recently. We’ve been getting lots of great shots over the past several days due to the occasional thunderstorms moving through the area. Overnight we got some pretty heavy thunderstorms across the area. A heavy round of severe thunderstorms hit the area just before daylight with severe thunderstorms warnings issued for Nelson and nearby counties. A tornado watch was issued for much of the morning hours as the storms worked through. A flash flood watch was also issued due to the heavy rainfall across Central Virginia. Today will be another day of thunderstorms with mostly cloudy skies. We will see some sun from time to time, but the rule will be more clouds than sun, with thunderstorms. Stronger to severe storms are again possible later in the afternoon. Storms continue through Thursday night, with sunny skies by Friday and very hot temps. The weekend looks hot with temps in the 90’s with partly sunny skies. Your Nelson County Life custom area forecast including: Lake Monacan, Ennis Mountain, Massies Mill, and Greenwood. WEDNESDAY: Mostly cloudy with scattered thunderstorms, some possible strong to severe in the afternoon. Breezy & Humid. THURSDAY: HOT! Partly cloudy with scattered thunderstorms in the afternoon. Hot! All mountain temperatures in the extended period roughly 10 degrees cooler than those in the valley listed. TUESDAY WEATHER : Sunny Morning : Scattered PM T-Storms Rest Of Week : Much Warmer!